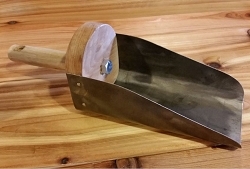 A favorite tool for gardeners! Comes with plastic sheath. 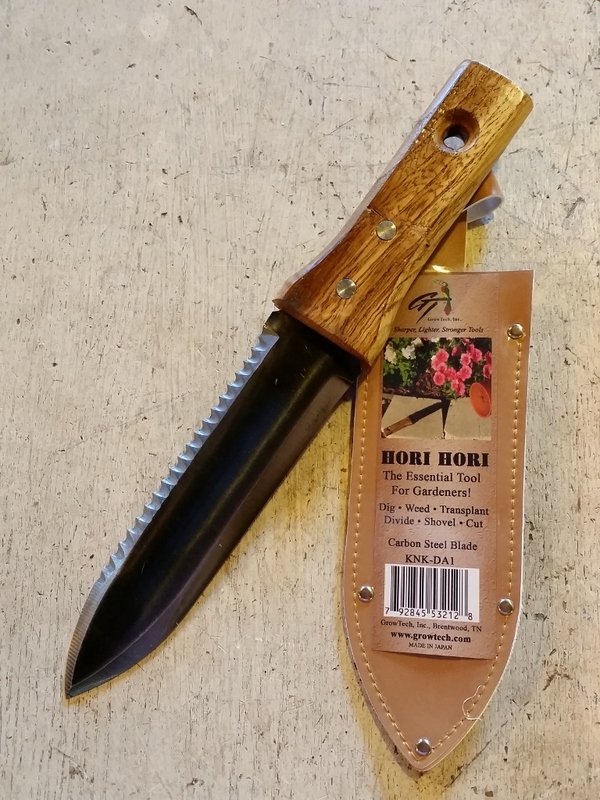 Over the past 30 years, a once obscure Japanese farmers knife, the hori hori, has .become immensely popular with American Gardeners. Derived from the Japanese verb “horu”,” which means “to dig,” the name hori hori is an onomatopoetic term which means “dig, dig” or “diggy, diggy,” depending on who’s doing the translating. The hori hori is primarily used for shallow digging and roguing out small and medium sized weeds. Its burgeoning popularity arises from its versatility. Americans love a tool that will do many things. Besides loosening soil, making small holes and pricking or grubbing weeds, the hori hori can be used for dibbling, excavating and sawing roots, harvesting root crops, cutting sod, dividing and transplanting perennials. Hori horis are made with blades of carbon steel or stainless steel, and with handles of wood or molded plastic. Typically, the blade is about ⅛” thick, slightly cupped, serrated along one edge, smoothly sharpened along the other, about 1 ¾” wide and 6 ⅞” long. The handle can vary in length between 4 ⅛” and 8”, giving the tool an overall length between 11 and 15 inches. It is essentially something between a stout knife and a hell for stout narrow trowel. While its origins are somewhat vague, the hori hori may have arisen as early as the 13th century as a tool for managing the “satoyama,” the boundary land between farm and mountain forests. There it would have been used to harvest or transplant wild vegetables. Another theory is that the hori hori arose in the wake of the “katana kari” or “sword hunt” ordered in the late 1500’s by Toyotomi Hideyoshi, the imperial prime minister at the time. Hideyoshi sought to restructure Japanese society by disarming farmers, merchants and artisans, ordaining that only members of the warrior class could carry the katana ( long sword) and wakizashi (short sword.) The hori hori is shorter and cruder in form than the wakizashi and, as a weapon, no match for daggers used by warriors. In 1876, Japan’s Meiji government outlawed--with certain exceptions--manufacture of the traditional swords. Bladesmiths shifted to making tools for woodworking, cooking and gardening. It is likely that, at that time, the hori hori began to evolve its current form and ubiquity. The hori hori that we sell is of the short wood-handled form and of carbon steel. It is tough and easy to sharpen. (The serrated edge can be sharpened with a chain saw file.) I prefer it to the stainless steel version which, while it holds its edge longer, is more difficult to sharpen and prone to snapping when used for prying up paving stone or other heavy objects.